For whatever your fishing rod needs – whether in salt or freshwater, fly or ice fishing – St. Croix has you covered. Around since 1948, St. Croix got its start in Park Falls, Wisconsin when Johnson brothers, Bob and Bill, came up with the idea to split the typical fishing rod into three segments, thus making rods more portable. Since then, St. Croix has been an enterprise of non-stop innovation in the world of fishing. They pride themselves on their hand craftsmanship that results in the pinnacle of luxurious rod design on the market. Similarly, St. Croix makes a commitment to superior engineering, specifically their trademarked Integrated Poly Curve and Advanced Reinforcing Technology. 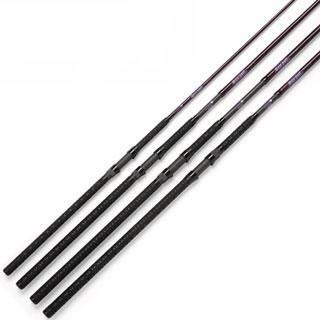 Their Integrated Poly Curve ensures the continuity of wall thickness throughout varying curvatures in your rod, giving you the smoothest possible rod, while their Advanced Reinforcing Technology utilizes carbon fiber material to strengthen the rod(by 10x the magnitude) without adding any weight. What you end up with are rods that yield varying lengths, power, and actions strengths. This added reinforcement is something that you are only going to find in a St. Croix rod. When selecting your ideal rod, it is essential you consider what type of power and action you will need. St. Croix has several power ratings, include seven different levels ranging from Ultra Light up to Extra Heavy. The power you need will depend on the type of lure and line used. Regardless of the size of the fish you are trying to hook, St. Croix has a suitable rod for you. 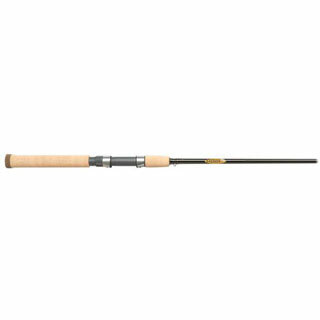 St. Croix rod action strengths also come in a range of values from Slow to Extra Fast. Each of the following rods feature their premium-grade cork handle, two coats of their slow-cure finish, are made with premium-quality SCII graphite, and utilize hard aluminum-oxide as guides. It’s clear that the company is committed to only using the best materials for their rods.With all this attention to design and detail, you will undoubtedly find the perfect St. Croix rod to suit any occasion. 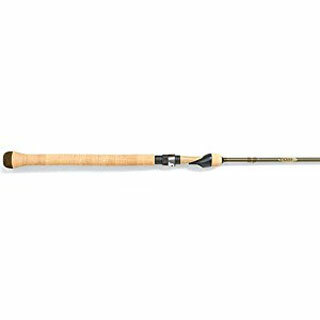 St. Croix Triumph Spinning Rods have an excellent feel, are designed for use in freshwater fishing, andare known for their fast action, durability, sensitivity, and hook setting performance. What makes Triumph Spinning Rods unique is their trademarked Fuji DPS reel seat/frosted silver hoods. They are excellent for catching trout or panfish but can also catch larger varieties, such as walleyes, as well. They will also work well with a variety of lines and reels and will give you a great sense of control regardless of the pairing. Despite its intended use for smaller fish, this rod still has plenty of backbone, and you can expect to have an easy time setting hooks and reeling the fish out of the water. Triumph Spinning rods offer one of the shorter lengths starting at 5’ and ranging up to 7’6”. The only downside with the Triumph Spinning Rods is if you are particularly interested in the place of manufacturing. Unlike most other St. Croix rods, the Triumph Spinning Rods are manufactured in Mexico. That aside, the design features that are associated with most St. Croix rods – the beautiful cork handle and lightweight graphite blank are consistentin these models as well. With the Triumph Spinning Rods, you are undeniably getting a great value. St. Croix’s Panfish Series Spinning Rods are the best for crappie, bluegill, and those other finicky fish that you would otherwise have difficulty sensing using any other rod. This is due to the Panfish Series’ incrediblerod sensitivity. The blank on this model, though still utilizing the SCII graphite that the other models do, to minimize weight, St. Croixincorporated what they refer to as a High-modulus/high-strain SCVI graphite. This not only reduces the weight, but it also maintains a balance to the rod. To further minimize the weight, rather than using ceramic guides, the Panfish Series Spinning Rods use Pac Bay Minima guides. This series offers a wide assortment of rod lengths ranging from 5’ to 11”. To assist with the sensitivity required when fishing for the more delicate variety of fish, St. Croix included the Pac Bay Minima reel seat with custom insert. Not only does this improve the sensitivity, but it is incredibly comfortable on your hands as well. What you end up with is the perfect rod for catching those fish that require the utmost sensitive touch. Be prepared to feel every little nibble. St. Croix’s Tidemaster Inshore Spinning Rods, as the name suggests, are designed for inshore saltwater fishing. What makes this rod unique from other St. Croix rods is its316 stainless-steel frame that is meant to help prevent corrosion. This rod also features the trademarked Fuji DPS reel seat and has an excellent backbone and tip for those larger fish – reds, snooks, flukes, bass, etc. As such, it is a versatile rod and is also sensitive enough to catch some of the smaller fish as well. With some excellent flexibility near the tip, the Tidemaster Inshore Spinning Rods work well with light lures. As a bonus, these rods are both designed and manufactured in Park Falls, Wisconsin, USA. The Tidemaster Inshore should be your rod of choice if you’re looking to hook those heavy-duty fish. Its strength will allow you to cast and catch those larger fish all day long, and thanks to the carbon graphite blank, you can accomplish this without tiring yourself. Tidemaster Inshore rods are offered in lengths ranging from the shorter 6’6” up to 8’ and are generally of either moderate or fast action. This rod will handle almost any fish perfectly and is a good option if you were limited to a single rod. St. Croix’s Mojo Surf Spinning Rods were made to help you go the distance. Made with surf guides and smaller guiding holes, this series allows for casting at great distances with increased accuracy. What additionally makes this rod unique is its handle. The X-Wrap style is meant to provide durability and comfort without sacrificing the style that St. Croix is known for. Handle aside, another facet of this series that makes it stand out from the others are the variation of rod lengths offered. Unlike the Mojo Inshore Spinning Rods that only go up to 7’6”, the Mojo Surf Spinning Rods are available in lengths ranging from 7’ to 12’. 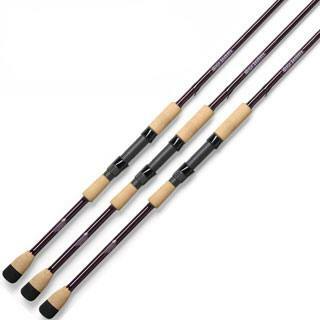 The action available on these rods range from moderate to moderate-fast. Using St. Croix’s Mojo Surf Spinning Rods, you will be able to catch larger fish at greater distances. Fighting with fish from far off has never been this easy. St. Croix’s Mojo Inshore Spinning Rods are a part of their saltwater series and is most comparable to the Tidemaster. Like their Tidemaster Inshore Spinning Rods, this well-balanced rod also features St. Croix’s 316 stainless-steel frame that improves in the prevention of corrosion. What makes this rod unique is the split-grip cork handle and trademarked Fuji DPS reel seat/black holds. This rod is durable with a fast action and strong, flexible tip. Though ideally used for smaller fish, this rod has enough backbone that it can handle the medium weight ones as well. Allowing for great accuracy, you can expect a smooth cast with this rod. Also like the Triumph Spinning Rods, the Mojo Inshore Spinning Rods, while designed in Park Falls Wisconsin, are manufactured in Mexico. If you’ve never held a St. Croix rod before, the first thing you will be amazed at the quality and feel.When you wrap your hands around one, you immediately feel like an expert angler. These rods prove the adage about getting what you pay for. Each of these rods utilizes their premium-grade carbon graphite, which is what gives St. Croix rods its ultralight, sleek feel. What you will find even more amazing is that regardless of their lightness, their strength will hold up to all your fishing needs. Even rods that are designed for smaller freshwater fish can take more than you would expect. Whatever you’re trying to catch, regardless of what type of water you’re in or what distance you’re shooting for, St. Croix has it all.With their offered varieties in strength and action of fishing rods and their 5-year warranty, it is no wonder that St. Croix is recognized as a premier manufacturer of fishing rods. 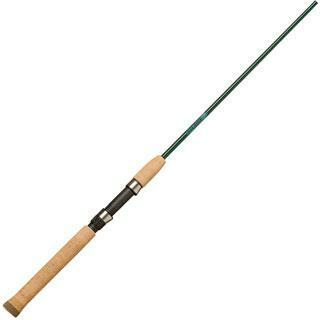 I recently purchased a 7’Panfish Series Rod. This is absolutely the best panfising rod that I have ever used. I used to have a 5’6″ and a 6′ of a different brand. I love the extra length for more accurate casting as well as keeping fish out of structures below the surface. I also love the feel of the new configuration of spinning seat and handle. It fits so nice in my hand and is very comfortable even after hours of fishing. THANK YOU for creating this pan fishing series of rods.